This species was formerly considered to range across much of the east coast of Australia, but was split as part of Horners restructuring of this genus. It is now restricted to the northeast coast. I recognized these tiny speed demons right away as close kin to the tidepool-dwelling Cryptoblepharus burdeni I had seen a few years earlier on Komodo island in Indonesia. I saw at least two dozen of them racing about on boulders and logs, but struggled to get any halfway decent pictures. 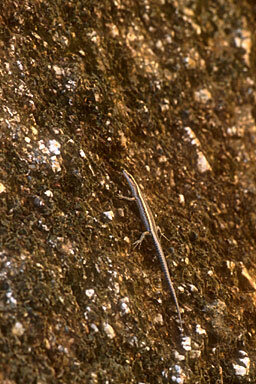 According to Horner, there are two species of Cryptoblepharus at Mareeba, C. virgatus and C. adamsi. My photos dont include enough detail to distinguish which of these two species I saw.